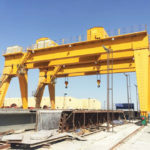 Rolling gantry crane is a sort of flexible lifting solution employed in many industrial and non-industrial workplaces, such as workstation, garage, workshop and freight yard. The rolling gantry crane more often comes in a small portable unit to easily and efficiently lift items. It is designed for light duty or infrequent service in many indoor places. 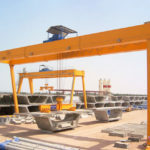 Regarding the rated load, ease of use and other factors, the portable gantry crane can be equipped with either a manual hoist or electric hoist. 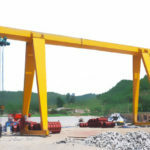 It is also available in multiple configurations and sizes, such as steel movable gantry crane, aluminum gantry crane, adjustable height crane and fixed gantry crane. The rolling gantry crane produced by Ellsen crane factory will provide maximum productivity and cost-effectiveness for your businesses. The rolling gantry crane is an ideal solution for flexible and portable lifting work since it is mounted to wheels at the bottom that allows you to move anywhere you want it to be. The movable gantry crane falls in two typical arrangement, steel and aluminum gantry crane that can be easily assembled and disassembled. Which type of gantry lifting equipment will best serve your needs? Robust steel gantry crane – it has sturdy construction and durable performance, making it perfect for heavier lifting than the aluminum construction. 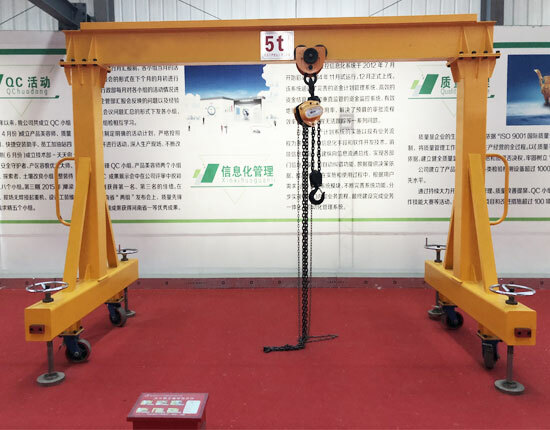 The heavy duty steel portable gantry crane is easy to set up and widely adopted in machine shop, warehouse and other indoor or outdoor places. Portable aluminum gantry crane – the aluminum construction provides light weight and excellent corrosion resistance. It allows for easy transportation, span and height adjustment and flexible movement. The service requirement of this small mobile gantry crane for materials handling is usually light and the lifting speed is relatively slow. The rolling gantry crane capacity is in a range of 0.5 ton to 10 ton to meet different lifting requirements. For heavier lifting needs or other special requirements, this particular crane will be custom designed and built. Light weight and simple operation. Flexible and effective material handling. Adjustable configuration in height and span. 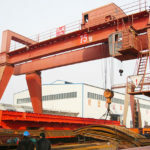 What Are The Common Uses of Rolling Gantry Cranes? Light assembly operation: to lift unfinished machines and parts in the light assembly lines. Installation operation: to handle materials in the initial installation of equipment. Infrequent maintenance: to assist to conduct maintenance work that requires standby or infrequent service. Light warehousing: to lift and transfer lightweight materials stored in the warehouse. Garage: to lift and move automobiles and engines in garage. 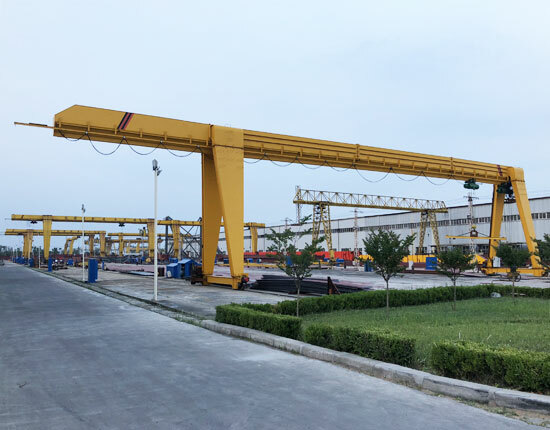 The travelling gantry crane produced by our factory always comes in the optimal arrangement for your demands so as to maximize the benefits for your business. 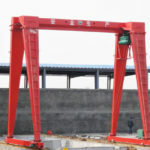 The rolling gantry crane design is optimized for easy assembly, disassembly, adjustment, transportation and relocation. Sorted by crane height, the traveling gantry crane has fixed and adjustable types for you to choose from. The crane height is designed on request. The fixed gantry crane is able to handle a large amount of weight and also provides ease of movement and maintenance. Adjustable I-beam: it allows for flexible span length. Adjustable legs: it allows you to adjust the crane height, making it easy to pass through a narrowed doorway or a low ceiling as well as move over obstacles or other materials. Heavy duty casters: it provides stable and reliable lifting movement. 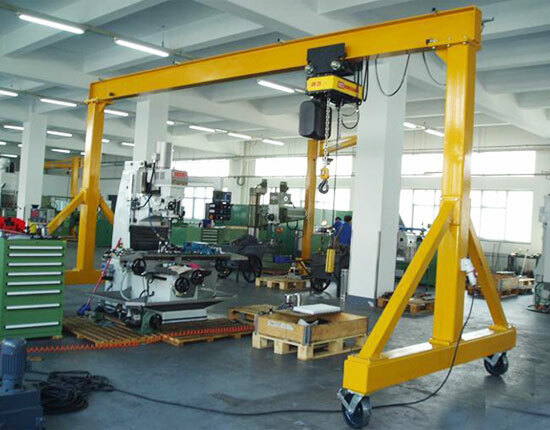 Hoist is an essential part of portable small gantry crane since it is the unit to performs the lifting work. Depending on power source, the hoist can be categorized into manual hoist and electric hoist. Electric hoist is the most efficient lifting device used with your rolling gantry crane. With regard to lifting medium you choose, the electric hoist can be grouped into chain hoist and wire rope hoist. It is designed to carry out light to moderate lifting tasks and is capable of handling heavier loads than the manual hoist. The electric hoist is usually operated by a pushbutton pendant control. The manual hoist provides slow lifting speed as it is powered by hand chain. Besides, it requires higher work efforts than the electric hoist. Therefore, the manual hoist is a cost-effective solution for light industry that requires infrequent or intermittent lifting. 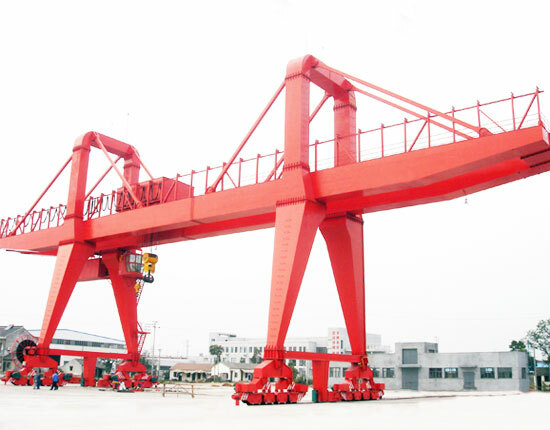 Grouped by girder construction, the gantry crane has two typical forms, single girder and double girder. Single girder gantry crane is designed for light to moderate service, which can be widely found in machine shops, light assembly lines, warehouses and repair shops. Whereas double girder gantry crane is ideal for heavy and even severe service, extensively applied in foundries, manufacturing plants, cement mills, steel mills and container yards. 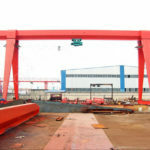 Base on safety consideration as well as for the sake of long service life, it is critical to specify your required work duty for industrial gantry crane in the ordering process so that the crane manufacturer will design the right crane for your needs. And also, it is worth noting that a crane designed for infrequent or light duty work cannot be put into continuous or heavy duty service. 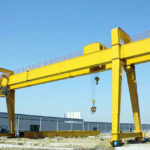 Ellsen machinery is a professional & experienced gantry crane manufacturer and supplier in China. We design and fabricate cranes upon your request. Depending on the lifting capacity, working environment, ease of movement and safety precautions, the gantry cranes can be configured in many different ways. Examples are single girder crane, double girder crane, semi gantry crane, truss gantry crane, cantilever gantry crane and mobile gantry crane. 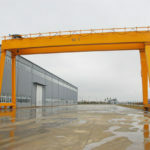 Interested in rolling gantry crane or other styles of cranes? call us now or leave a message!